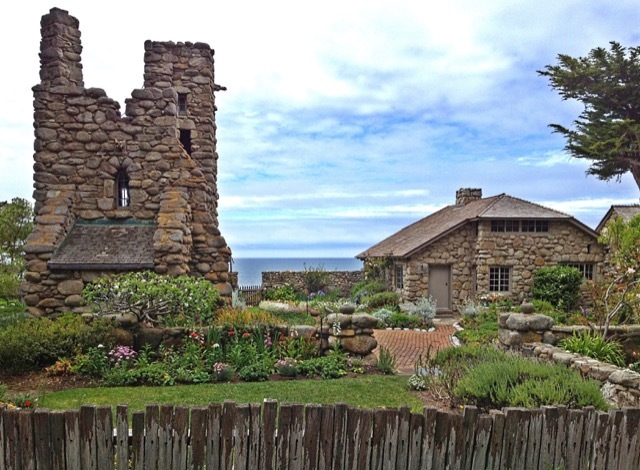 The Tor House and Hawk Tower, both stone buildings built by the poet Robinson Jeffers. 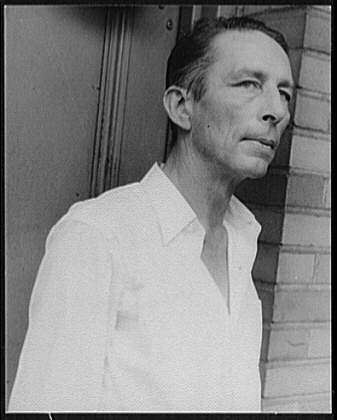 Robinson Jeffers by Carl Van Vechten. The undulant sweep of a rocky coastline dotted with pale crescents of sand is a known enchantment even if the captivated aren’t accustomed to waxing poetic. When the enamored are, lyrical evidence abounds. Case in point is Robinson Jeffers, a poet who embraced such a landscape as passionately as any writer could. 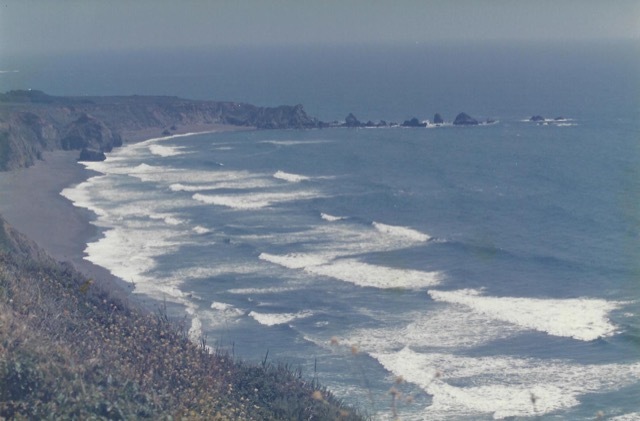 It all began with a piece of land that Robin, as his friends and family called him, and his wife Una bought, which rippled along the hem of the Pacific Ocean near Carmel, California. He was so smitten with the granite rocks cascading down to the Pacific, rough due to a constant sea-washed rhythm, that he asked a local mason to let him apprentice so he could learn the art of stonemasonry. Once he felt confident enough, he began building a stone cottage for his family, which they dubbed Tor House. And hills tower, waves fall. 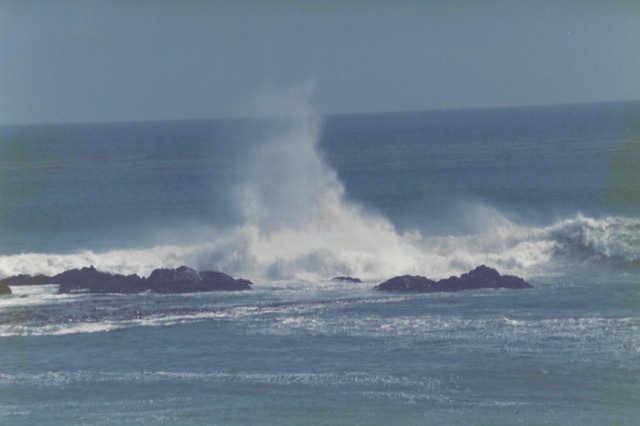 Waves roll ashore on the California coastline near Carmel. Farther into the heart of the poem, he crafted one of my favorite lines: “The tides are in our veins.” This is what rushed into my mind when I saw images of the exquisite new introductions in the Currey & Company summer releases that reflect the splendor of the sea’s greatest gifts, each ocean-inspired creation bringing me a great nostalgia for that legendary stretch of coastline I had visited as an impressionable young writer. I spent hours beachcombing there, adding to my selection of beach glass and shells from every sandy stretch of the earth I’ve ever visited. 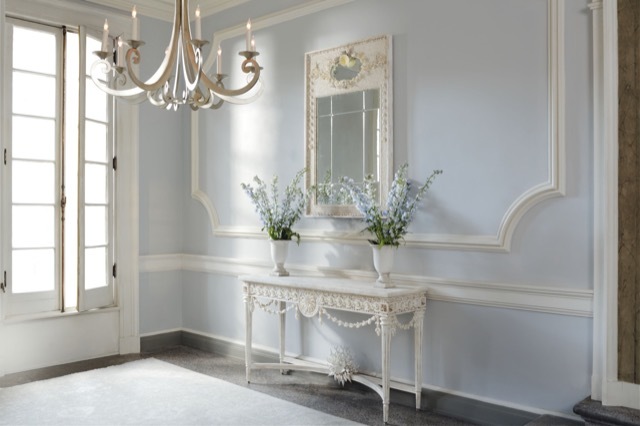 Devereux Console and Mirror in an ethereal setting as soothing as a calm expanse of ocean. Photography Mali Azima, art direction/stylist Thea Beasley; image courtesy Currey & Company. Curious about how pieces with such demanding detailing as the Devereux Console and Mirror (shown above; from a previous collection) are crafted, I asked Bethanne Matari to share when shells and tumbled glass first came into the Currey & Company product-line. She explained seashells and other natural elements have been offered since 1998. 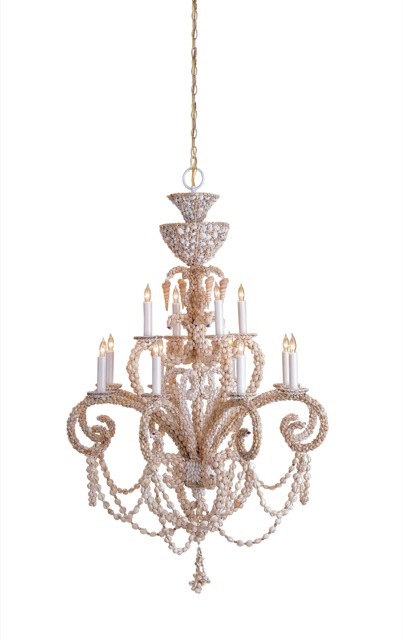 The shell-encrusted Grotto Chandelier (below) was among their first introductions, remaining in the company’s offerings for over 12 years. It was featured in all the major design magazines at the height of its popularity, the nautical detailing a natural for the manufacturer because its founder Robert Currey has always loved shells. The Grotto Chandelier, an early shell-encrusted introduction. Cecil Adams, the company’s creative director, explains how shell- and glass-ornamented furnishings are created, and shares the inspiration behind their designs. “All of our shell items are completely done by hand so each and every tiny shell is placed one by one—for larger items, there could be as many as four people working on the same piece at once.” he says. “Our design team in the Philippines will take an idea and actually create it on site in our factory using all the available shells. As they come up with a pattern for a particular piece of furniture, they record the process and keep an original sample there so it can be reproduced accurately. This is equally true for the tumbled glass offerings Currey & Company creates. These elegant furnishings call to mind the treasured beach glass that glints from the water’s edge as the waves ebb, later drying to a velvety matte silkiness after being removed from the wetness of the sea. The Shoreline Pendant in a Harlow silver leaf finish. The Shoreline pendant is a new beach glass-inspired offering, the wrought iron and glass fixture shown above with a Harlow silver-leaf finish. The Bayou Pendant resplendent with its contemporary gold leaf finish. The Bayou chandelier, also a wrought iron and glass fixture—shown with a contemporary gold leaf finish—is another. 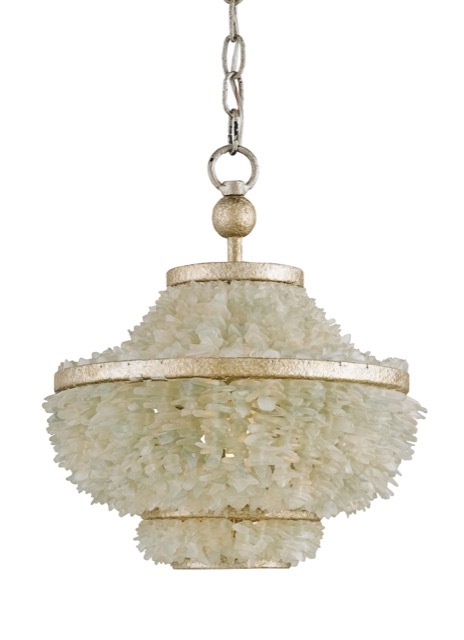 But one of my favorite fixtures incorporating glass is their Medusa, below. With its fluid and delicate profile, the fixture imitates one of the ocean’s most graceful creatures, the jellyfish. The lovely Medusa Multi pendant. 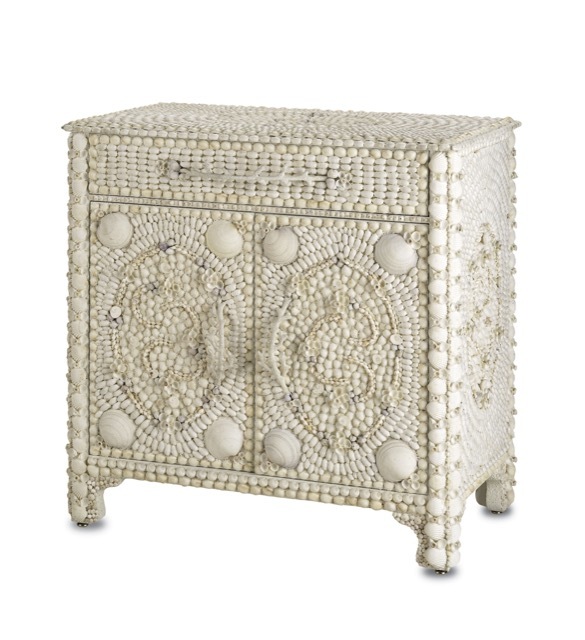 “Shells, tumbled glass and mother of pearl bring a divine natural glow to interiors whether their presence is in the form of a collection displayed in a cabinet of curiosities, or a fabulous shell encrusted console table, chest, or over-the-top wall accent,” Cecil remarks. 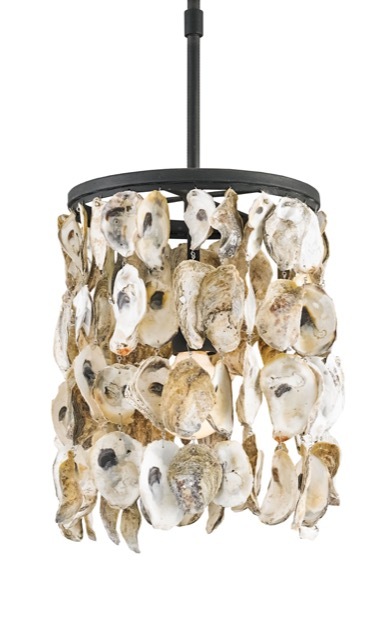 I have always been impressed with how inventively the manufacturer makes oyster shells shine in their new introductions ornamented with them. Oyster shells are as plentiful in the Philippines as they are in the southern state she grew up in, and used there for driveways and pathways as well. The Stillwater pendant, its frame made of wrought iron and shown in a blacksmith finish. 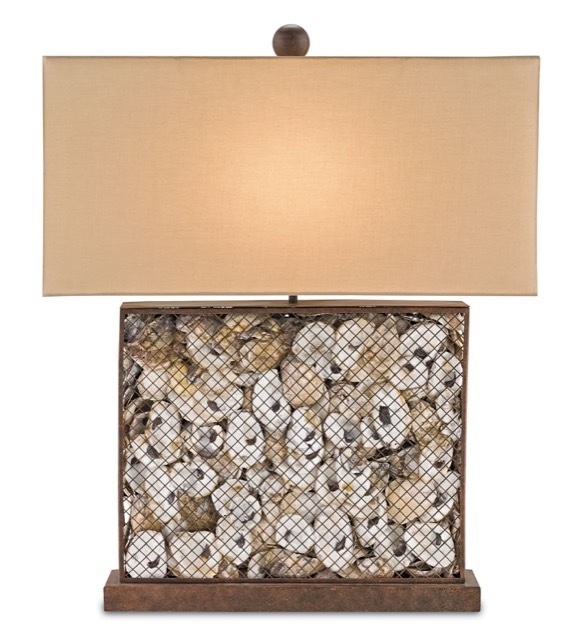 The Oyster Bay Table Lamp, its frame made of wrought iron and shown in a rust finish, topped with a beige shantung shade. 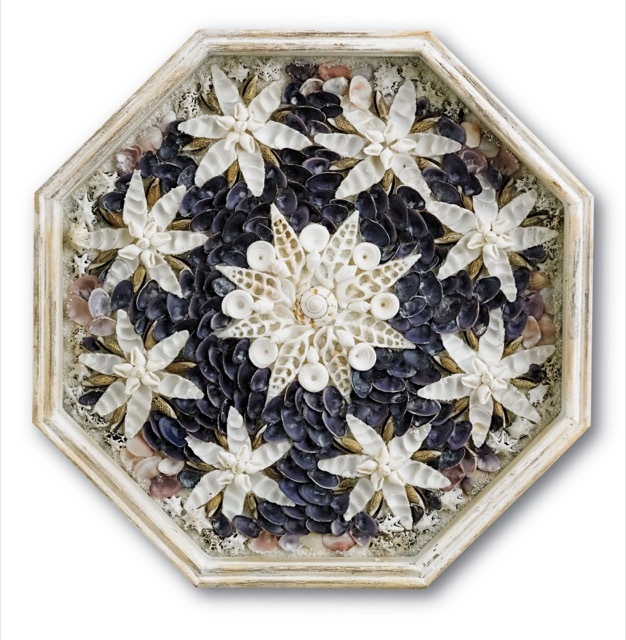 Also included in the Currey & Company shell offerings this season is a new Sailors’ Valentine, one of the intricate pieces of wall art inspired by historical designs that were created by seafaring souls as symbols of love. This Sailors’ Valentines’ wood frame finished in antique white is artfully filled with seashells that form a composition created with floral-like starbursts. The creative team will often turn to books in the company’s library to create products inspired by the past, one of them a visual survey of how the designs of Sailors’ Valentines have progressed over time. The Marchmont Sideboard adeptly covered in a pale coating of shells to bring it a subtle monochromatic texture. Learning about Robert Currey’s desire to bring the ocean’s beauty into his product offerings, such as the Marchmont sideboard above, and the fact the creative team has continued to practice such an artful level of nautical winsomeness over the past nearly two decades since then brings me back around to the memories of my meaningful trip to Carmel when reverence for a poet swirled in me as I crunched along the pebble-strewn sand. No wonder Jeffers so adored the divine superfluous beauty surrounding him. It was as if Jeffers’ cadence permeated the air with a similar ebbing and flowing as the water rolling ashore. I closed my eyes and tried to internalize the incantation of the waves, recognizing how archetypal his love for the coast was when I caught a glimpse of the stone buildings he’d built with his own hands, the compound now a beautifully maintained legacy thanks to the Tor House Foundation. The property was added to the National Register of Historic Places in 1976. 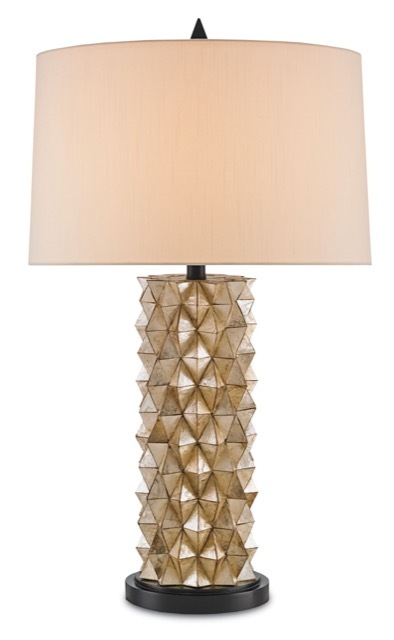 The Cloister table lamp made of wood is ornamented with Capiz Shells and topped with a shantung shade. The finishes shown are natural and glossy black. 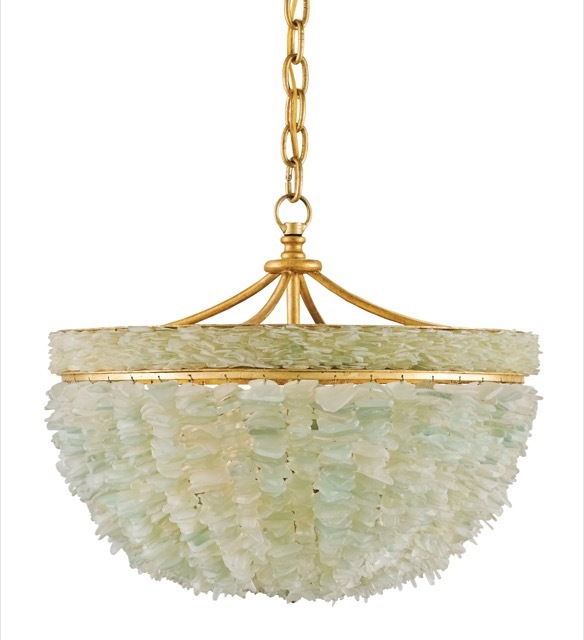 You’ll have the advantage of enjoying your own hit of elemental pleasure if you are fortunate enough to be in either Dallas or Atlanta for summer market, as the new Currey & Company shell and tumbled-glass introductions, such as the Cloister table lamp above, will be shown in both cities. Make your way to the Dallas showroom on the 10th floor of the World Trade Center in suite 10000 between June 24th and 30th if you are in town. The Atlanta showroom is on the 14th floor of the AmericasMart Building 1 in suite 14F10. The offerings will be on view there between July 7th and 14th. If you go, share your image of your favorite seashore-inspired piece with me on social media, would you? You can find me on Instagram, Twitter, Pinterest, Google+ and Facebook. *The Aura of the Sea is © Currey & Company, all rights reserved. This entry was posted in Currey & Company, History, Products and tagged Accessories, cabinets, Chandeliers, console tables, Gold, mirrors, Natural, nautical, Oyster Shell, Rustic, seashell, Silver, Table Lamp, White, Wood on June 18, 2015 by Currey & Company.